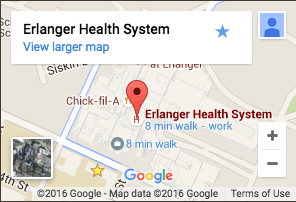 Erlanger Health System features the most comprehensive radiology and imaging services in the Tennessee Valley. From basic procedures such as chest X-rays to state-of-the-art-stroke care provided by interventional radiologists, we provide unparalleled levels of service for our patients. Radiology is often the foundation for information provided in a non-invasive setting. Radiology can provide information on things as simple as a broken bone to the detection of cancer, infection, or other illness. It can also be the treatment mechanism, as is the case with some nuclear medicine studies as well as interventional radiology procedures. What Is Role of a Radiologist? The radiologist is the physician who interprets imaging studies and performs imaging-guided procedures. All radiologists at Erlanger Health System are subspecialty-fellowship-trained and are committed to being an integral part of the patient's care team. Baroness Hospital is home to one of the region’s best PET/CT scanners, a vital tool in staging and measuring response in cancer treatment, as well as detecting diseases like Alzheimer’s. In addition, the 3T MRI at this location gives our radiologists a detailed view of patients, enabling primary physicians and specialists to make the right treatment decisions. Baroness is also home to top-of-the-line interventional care. Stroke care, aneurysm and cancer treatments as well as abscess drains and angiography are all part of the procedures that can be performed by our interventional radiologists. Children’s Hospital at Erlanger features low-dose CT and X-ray capabilities for pediatric patients, as well as all other imaging modalities, ensuring that children are exposed to the most minimal amount of radiation possible while providing the pediatric radiologists on our staff with the views they need to provide the proper diagnosis. Erlanger East offers the option of state-of-the-art imaging to patients who prefer to be seen on the East side of town. Our Center for Breast Health at Erlanger East offers mammography with tomosynthesis. Erlanger East also provides MRI, CT, nuclear medicine, X-ray, ultrasound and bone densitometry Interventional services such as cerebral angiography, some vascular services and uterine fibroid embolization are performed at Erlanger East as well. Erlanger North features X-ray, CT, nuclear medicine and ultrasound services as well as bone densitometry and mammography in a convenient location for those living on the north side of town. Erlanger Bledsoe features CT, X-ray, ultrasound, mammography and bone densitometry.